Available in 5 or 6 inch in a variety of colors. – 29.7 inches of water per hour (20 foot roof section). That’s 2.5 times greater than the official rainfall world record. 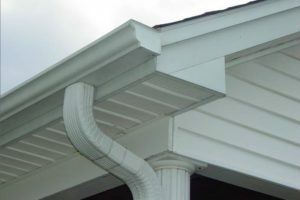 Gutters are troughs that collect rain running off a roof and channel it, with proper slopes, to downspouts that carry the rain water to the ground and away from your siding, windows, doors and foundatio.. In the course of collecting water, open rain gutters also collect leaves, acorns, pine needles, and other debris which can cause clogs anywhere in the gutter itself or sometimes in the downspouts. Clogged gutters and downspouts can cause rainwater to overflow, potentially causing substantial damage to your building, landscaping and basement which is why they should be cleaned on a regular basis. Covers for gutters, gutter guards and screens to keep debris out, can reduce or eliminate these problems and lengthen the life of your gutters. 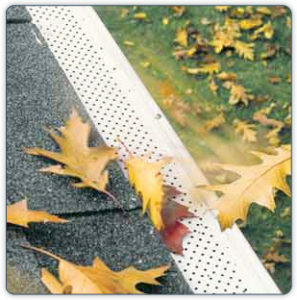 Our gutter guard of choice is the Alcoa Leaf Relief.